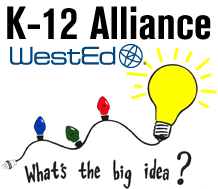 The California Science Teachers Association (CSTA) Board of Directors has selected WestEd’s K-12 Alliance as one of two recipients* of the 2016 CSTA Distinguished Contributions Award, for its sustained and significant impact on science education in California. “Throughout their [K-12 Alliance’s] two dozen years of work, several things have remained consistent. They provide high-quality professional learning opportunities for educators. Their staff is well prepared, knowing content, pedagogy, and facilitation. Teachers leave having learned and with increased confidence in their abilities to teach science. K-12 Alliance staff will be honored at the CSTA Awards Luncheon, October 22, 2016, Palm Springs, CA. * The California Science Project is also a recipient of this year’s award.